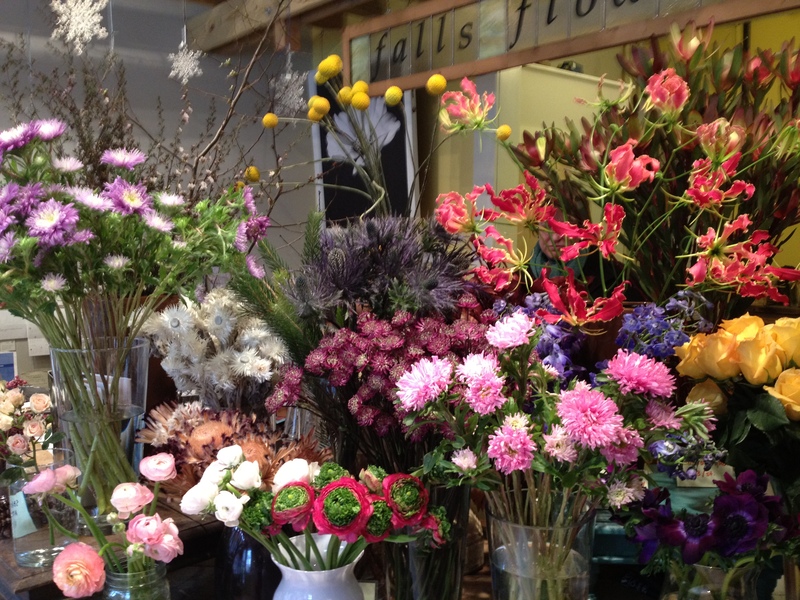 My first day at Falls Flowers – Jan 19th, 2012…a quiet Thursday in East Falls. 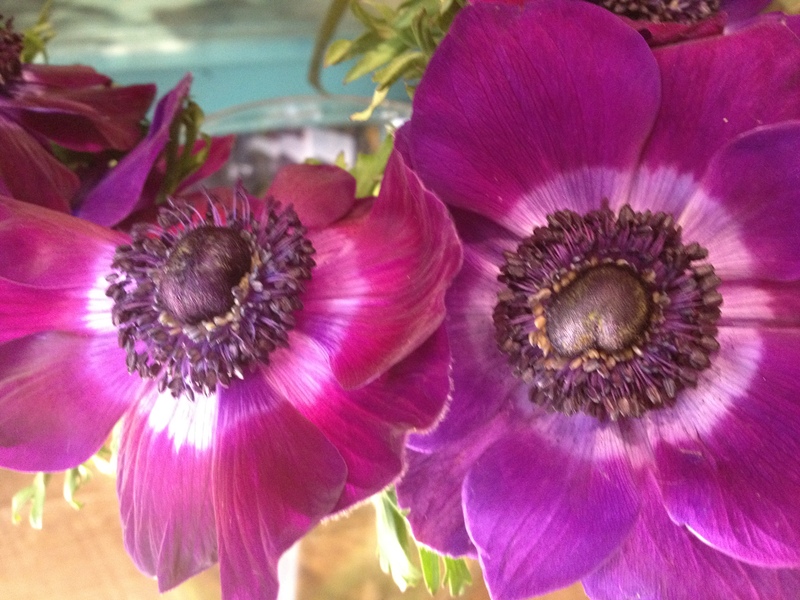 I started by processing flowers that had been hydrating; and I learned a lot today! For example, when flowers first arrive, they should hydrate for an hour minimum – if you don’t, their little heads could droop beyond rescue. 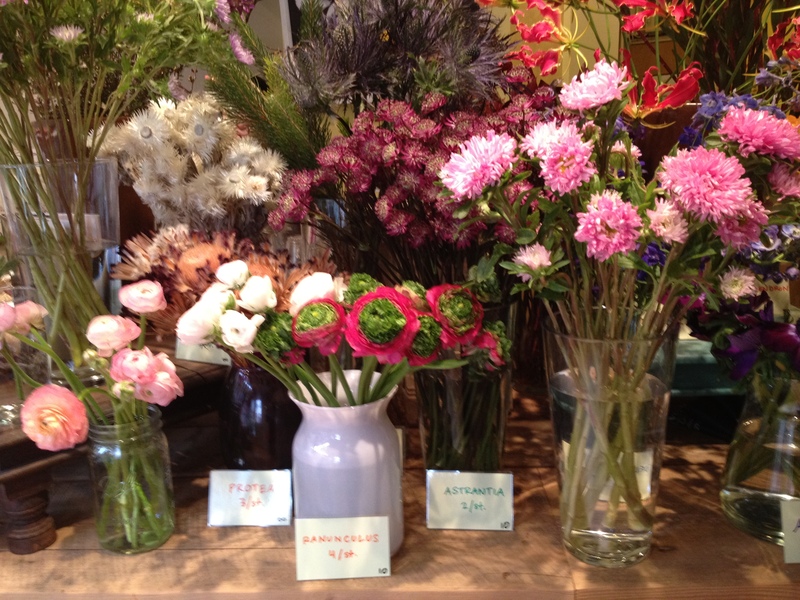 Some flowers are more prone to wilting than others; but initial hydration is a big must for everything. 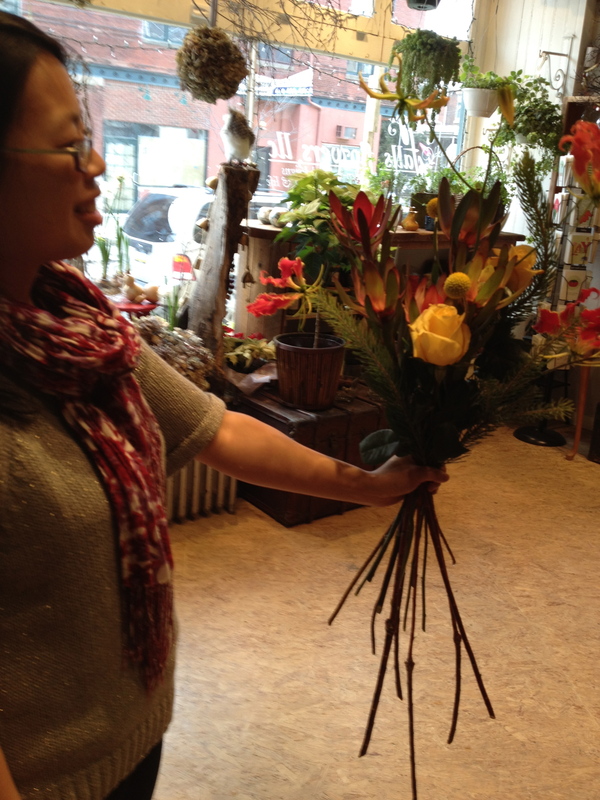 The proprietor, Peicha Chang, gets her flowers from a variety of Philly vendors, who get their stuff from NYC or local growers when possible, and the NYC flowers come from Holland, Japan, South America, and beyond. 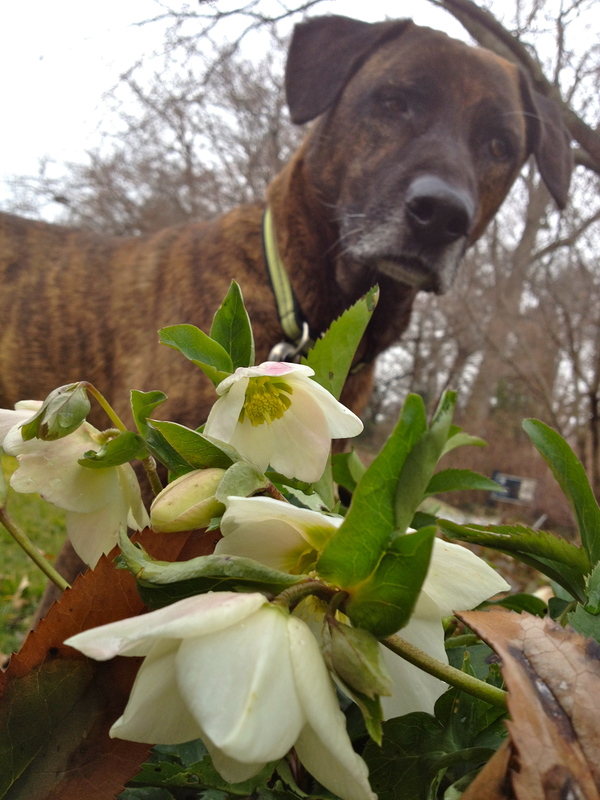 For Christmas and Easter, she’ll go up to the NYC flower market herself. I guess there’s no way around being slightly uncomfortable at the environmental impact shipping flowers all over the world has, and if there were a way to stock only locally grown flowers, she would be doing this, but for the kind of variety she wants it’s just impossible. Not sure how I feel about this part of the industry, as flowers are not a ‘necessity,’ really. It would at least be nice to know if the farms that are growing your flowers are growing them sustainably, not just for the soil’s sake but for the workers and their exposure to chemicals. More on this later as I dig deeper. 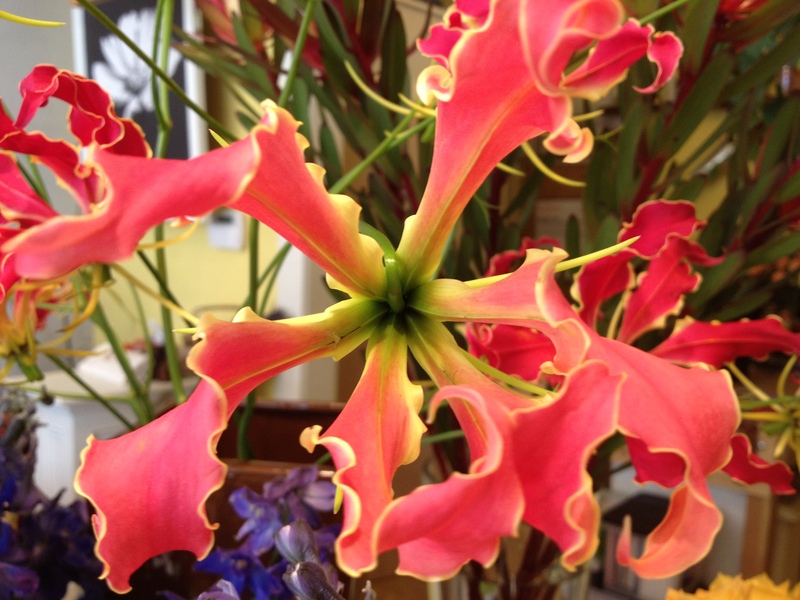 Meet the Gloriosa lily. This gorgeous lily is actually a climbing vine, and looks as if she’s throwing her petals back from the exertion of the journey. 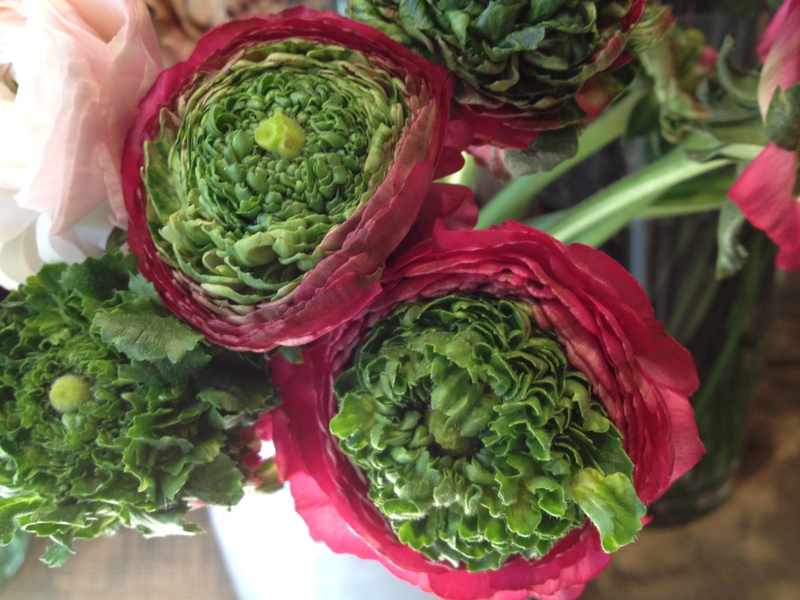 And hello to you, French Ranunculus. I have never seen the likes of you before. 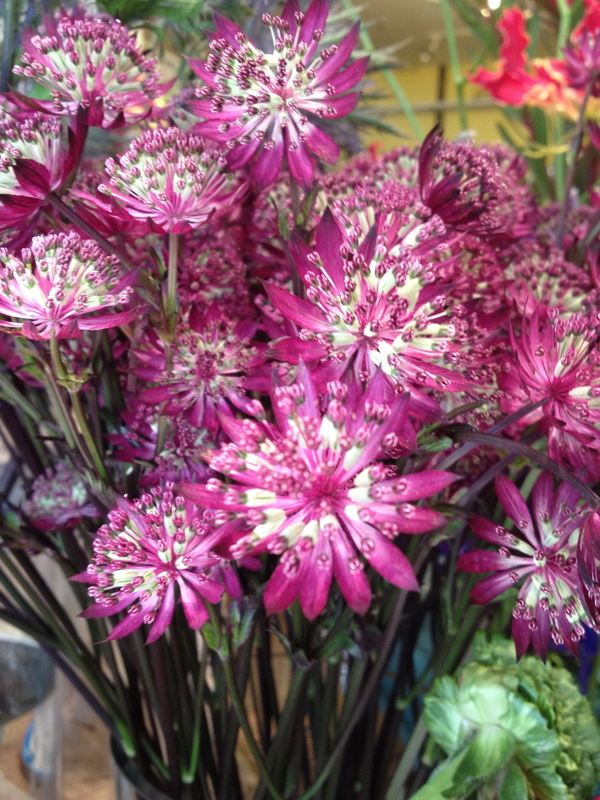 My other favorite of the day is the Astrantia, a cut flower I believe she said was Dutch grown but I’ve seen growing quite happily in gardens in the Northeast. The stems have a purplish tinge to them and so do the leaves and as you gaze at this plant’s structure you may be reminded of Queen Anne’s Lace, or Fennel, or Dill…all members of the Carrot Family. Oh, I love you Starflower. Now for some how-to, so I can remember what the heck I did: in processing flowers, the key is to remove any leaves/thorns that will be sitting in water. It’s important from a ‘rot’ standpoint but also super important when you’re in a busy floral shop to be able to pull a stem easily from it’s container without it tangling up in others. This is something I hadn’t really thought of before. Removing 2/3 of the lower leaves also creates a cleaner visual impact, something that most people don’t do when they bring a bouquet home from the grocery store, and it makes all the difference in the world to me. After removing the leaves, I cut the stems at a 45 degree angle for maximum drinking potential. Some of the woody stems (Quince) are also cut vertically to create more surface area for the water to climb. I mostly used pruners, but lots of floral pros use knives to trim thorns off of roses and cut the stems. There is an art to it, for sure. Check out the quick video of my first KNIFE LESSON! One of the areas I really need to learn more on is vase expectancy! When I made labels for the display items, we put the number of days you could expect the flower to thrive after bringing it home. Some were 3, others were 14, others were ∞ because they were dried (Protea, Everlasting, etc.) She just rattled off the numbers! This is a very important piece of the puzzle I’d like to learn. The quick bouquet lesson at the very end of the day was probably the most fun to watch for me, because Peicha’s experience really shined. I like to think I have some skill with flowers, and I may have more than the average person, but when you see a master working, you’ll be blown away. She confidently chose an array of materials for two different bouquets, but I only took a pic of the second one. She used the South African Leucodendron as her base, following by the flaming Gloriosa Lily, ‘Gold Rush’ Roses, some Billyballs, and even a few evergreens which I thought really made it work (salvaged from the holiday buckets in the fridge.) She likes to work with odd numbers as they’re “more dynamic,” but if you have to go even use 2…or 6 I think she said. In the end she was holding a $40-$50 bouquet of unusual and beautiful flowers. I have so much to learn!